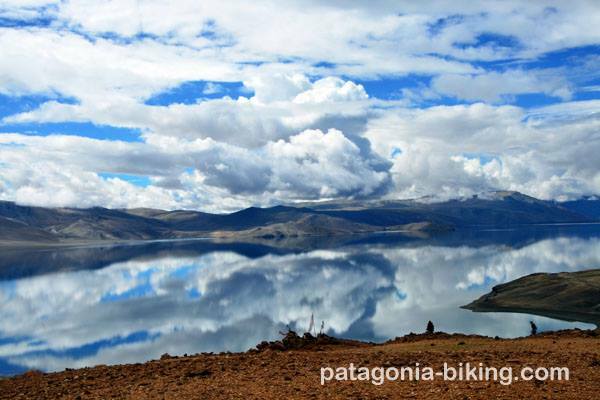 This trip is done in an area called “Little Tibet” and it can be considered as a paradise for those bicycle riders who love mountains. They will have the opportunity to find themselves closer to the skies than anywhere else on this planet. 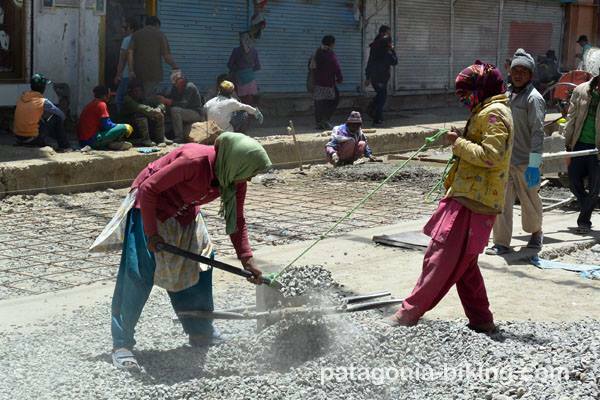 Also closer to “free” Tibetan culture. The trail we will follow was designed to visit selected locations, and 90 % of it will take place next to rivers and lakes. 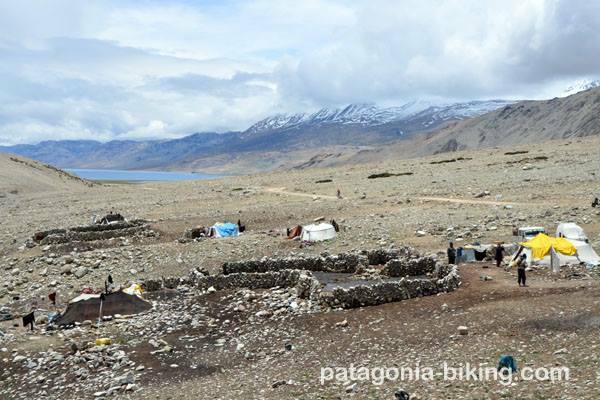 Some of them are the Indus River Valley, Nuba Valley and lakes Tsomoriri and Pangon tso. 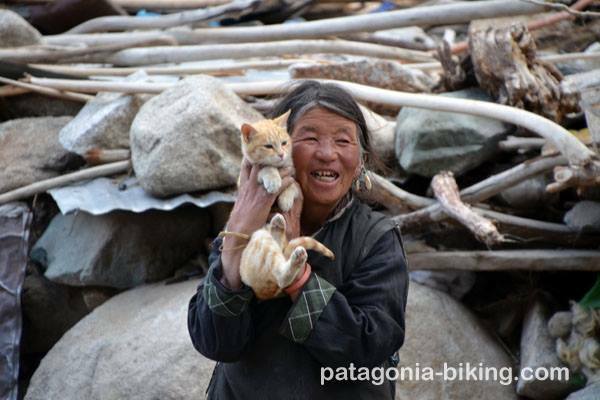 There will be plenty of encounters with local inhabitants: monks, shepherds and farmers. It’s guaranteed that with their humility and charisma they will give us beautiful memories to treasure. At a slow pace, because that will be our trip’s rhythm, we will not be short of breath to take this paradise’s special energy to the bottom of our hearts and lungs. Meeting at the hotel, bicycle testing and introduction dinner. Flights usually arrive from Delhi at around 10 am. Day off. 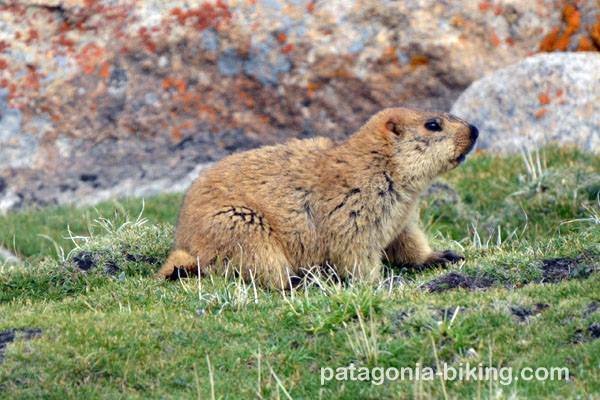 Rest and getting used to the altitude. Walk around town. Lunch not included. 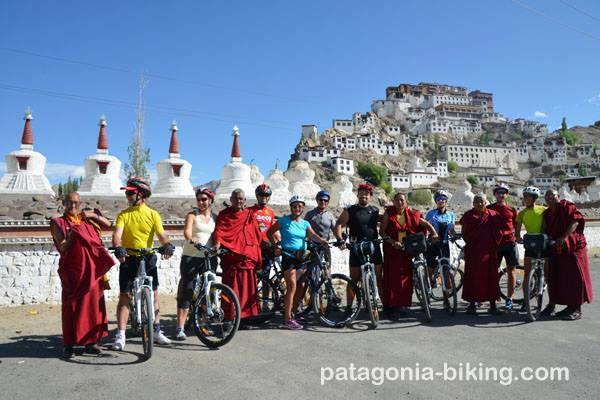 We will visit the most emblematic monasteries in the area. 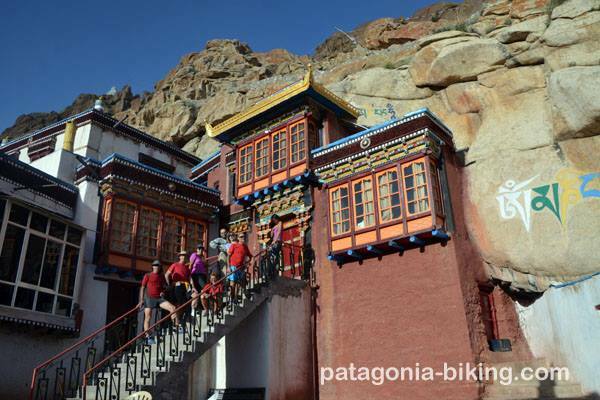 Tibetan Buddhism is more strongly expressed here than anywhere else, and it becomes part of the landscape with its impressive architectonic manifestations. 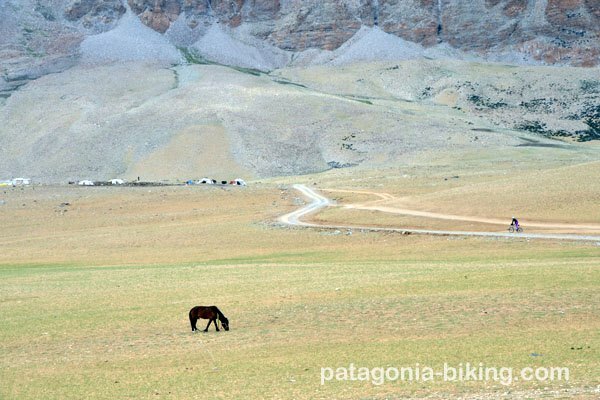 We will ride to Hermis on our support vehicle and then to Thiksey on our bicycles. 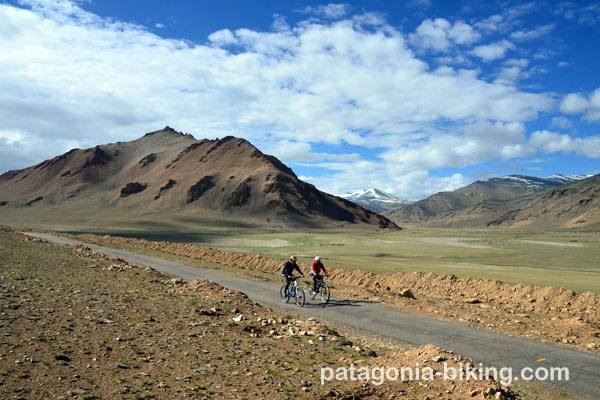 We will ride alongside the river Indus and, from Ubshi onwards we will do so on a narrow, secondary road with beautiful scenery. 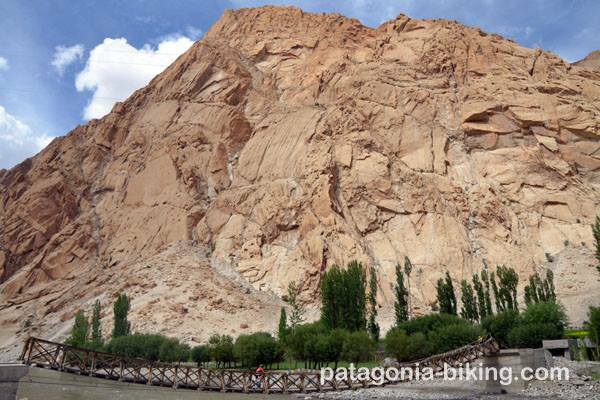 We will continue to ride along the sacred river Indus, until we reach Chumatang. This is a place well-known for its medicinal and thermal waters. 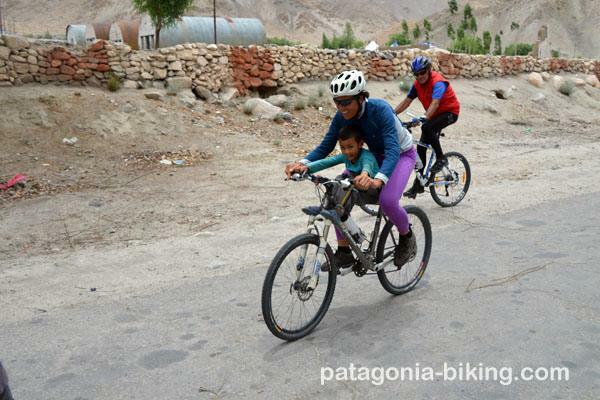 After crossing a bridge in Mahe (4200mosl), we will ride away from the Indus river and into a narrow valley until we reach the green village of Sumdo. 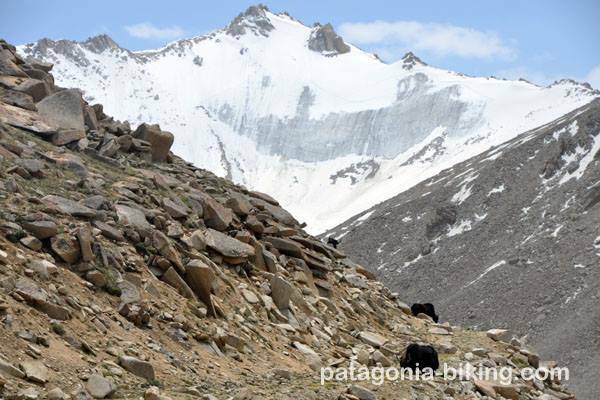 We will camp at the base of our first high mountain pass. We will ascend for 11.5 km up to Nusguur La pass at 4840mosl. 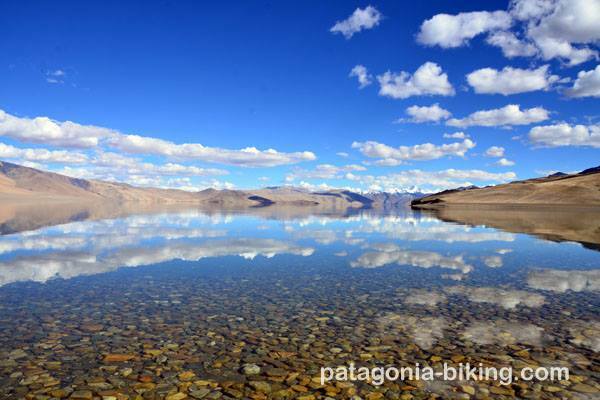 Then we will descend with views of the Kyagar Tso turquoise lake. 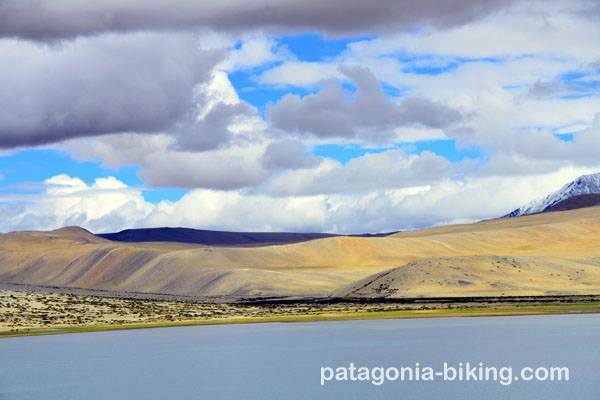 We will then continue on a dirt road until the village of Korzog, on the banks of the Tsomoriri lake. Day off. Walks around the area, enjoying lake Tsomoriri and scenes from the rural life in Korzog village. We will go back to the Nusguur La pass (4849mosl) in the support vehicle. From there, we will descend 12 km to Sumdo. 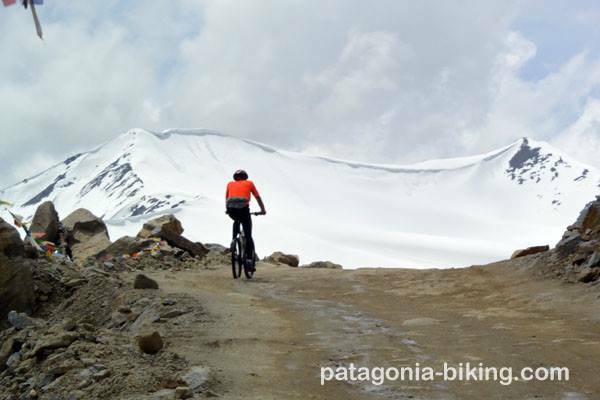 Then begin a 20 km ascent until we reach Pololongka Pass (4970mosl). 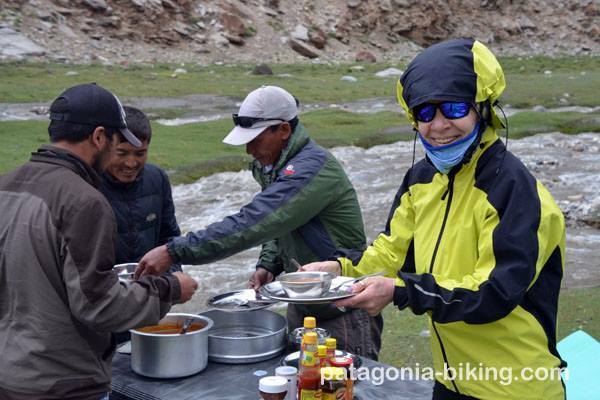 We will continue our descent for the next 20 km until we reach the village of Pongunagu (Tsokar) (4532mosl). Distance: 52 km. Level difference: -1100m, +550m. 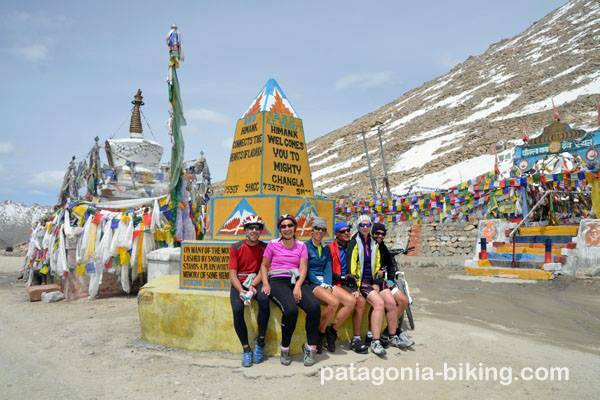 We will be riding the first 20 km on a plateau and the following 20 km (15km on dirt) will be on a mild ascent until we reach Tanglang-La Pass (5330mosl). Then we will descend 60 km on pavement. We will go through some quaint villages: Rumtse, Gya, Rong. Distance: 102 km (20 km gravel). Level difference: +850m, -2000m. 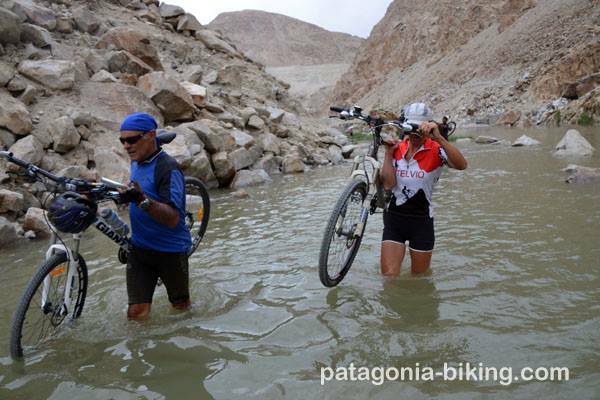 We will ride once again by the river Indus. 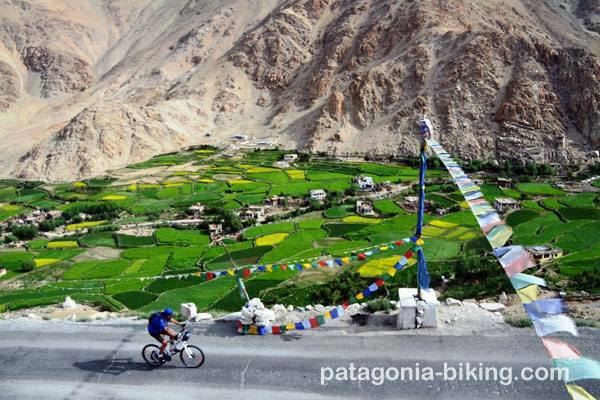 At km 16 we will take a detour to another interesting valley, riding by Chemrey monastery and finishing the stage at the small village of Sakti. Quiet stage with smooth level differences. 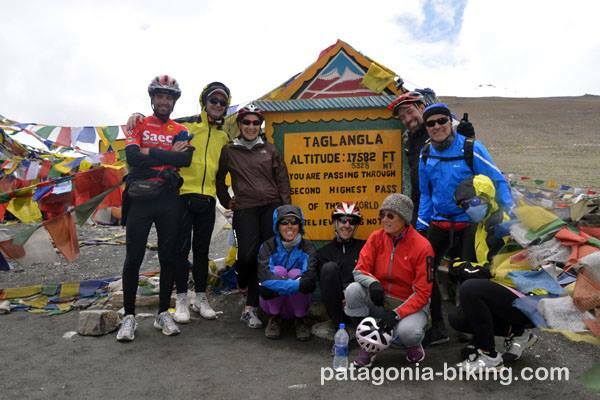 The first 30 km will be an ascent on our bicycles to reach the Chang La Pass at 5360mosl. 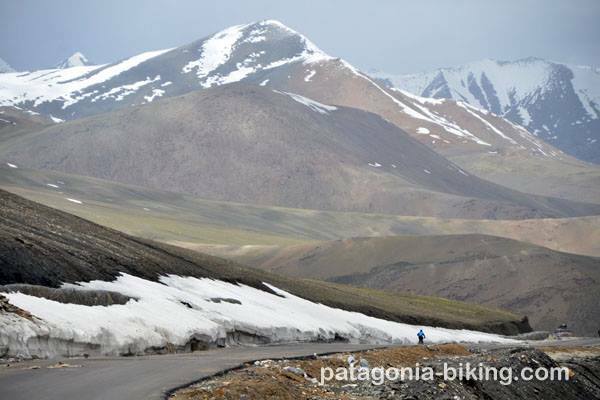 Then we will descend 30 km to Durbuk. 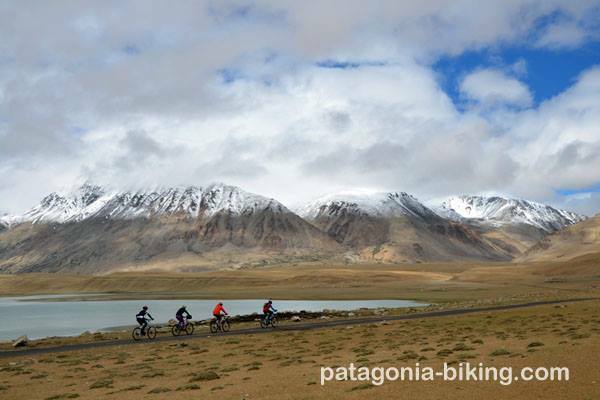 There we will load the bicycles in our support vehicle and transfer to Pangong Tso lake, considered the largest and most spectacular in the area. Distance: 60 km. Level difference: +1500m, -1500m. 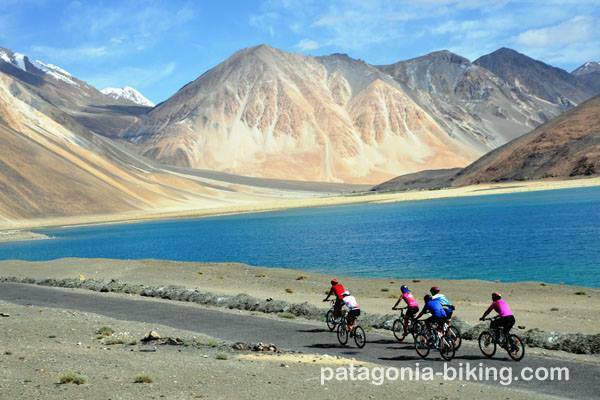 We will ride our bicycles completing the stretch we did not do the day before, riding along the Pangong Tso lake. 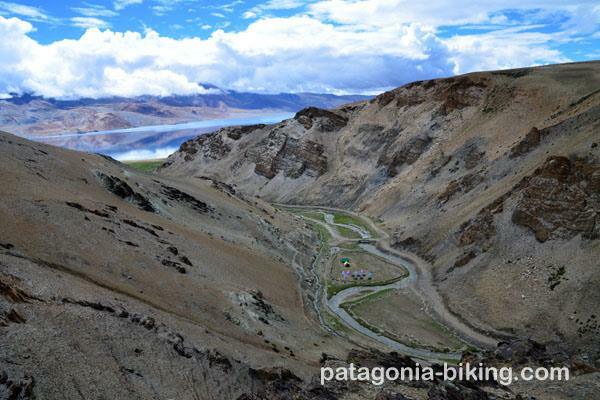 We will ascend a brief pass and then descend to the valley of the river Shyok. Distance: 65 km. Level difference: -800m, +400m. 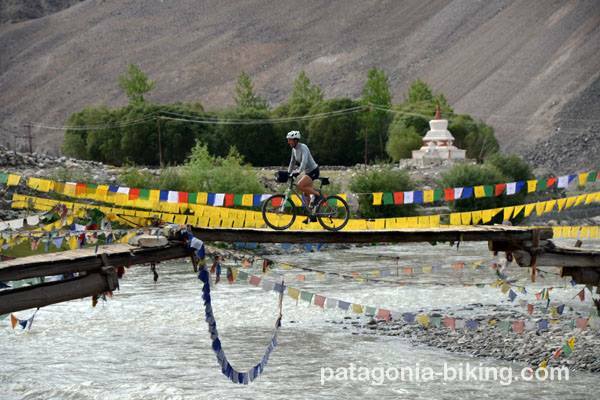 We will ride on a narrow and quiet road (trail), alongside the river Shyok. There will be little level difference, mainly descending. We will reach Agyam. 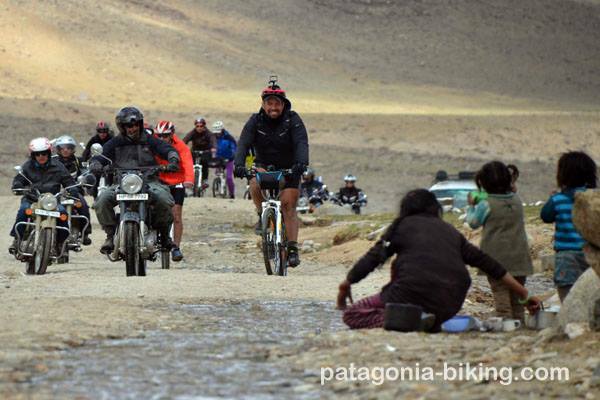 Distance: 40 km pavement and dirt. Level difference: -500m, +200m. 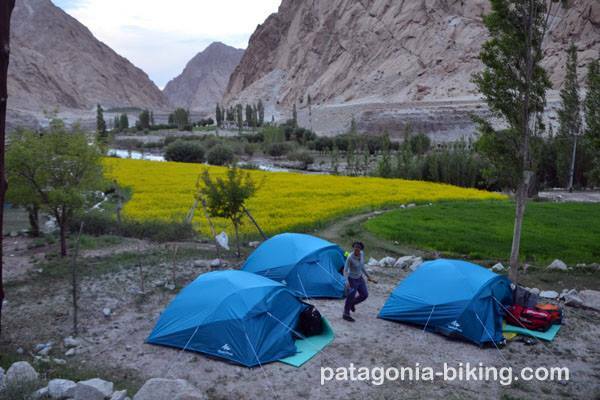 We will ride our bicycles through the Nubra valley, known as Ldumra or “valley of the flowers”and is located between the mountain ranges of Karakorum and Ladakh. The flat part of the valley is sandy, has willow trees, poplar trees and is full of farms. 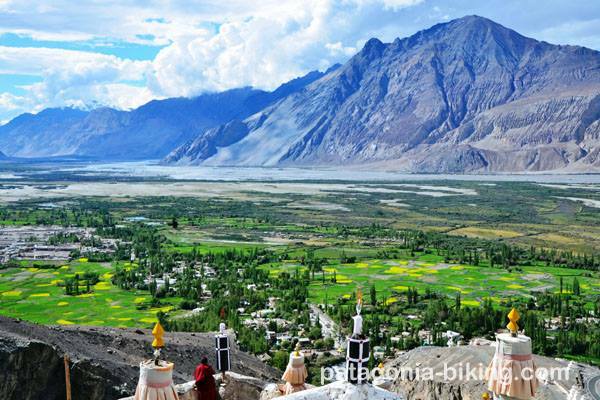 The Nubra Valley was one of the commercial hubs of the Silk Road. 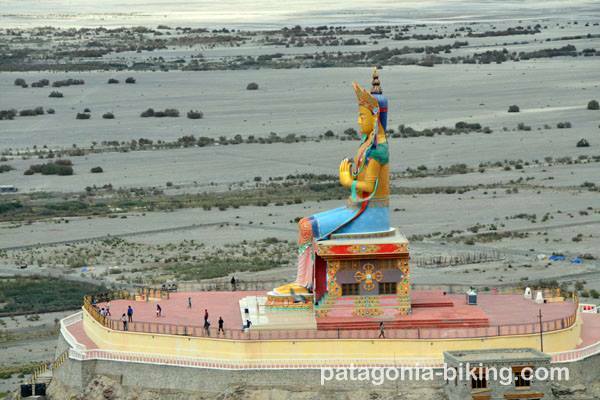 The trip will continue by the river Shyok, riding on panoramic ledges until we reach Duskit, a village with a panoramic monastery that has an enormous statue. In the afternoon we might go into the small village of Hunder (10 km), appreciate its dunes and maybe ride a Bactrian camel. 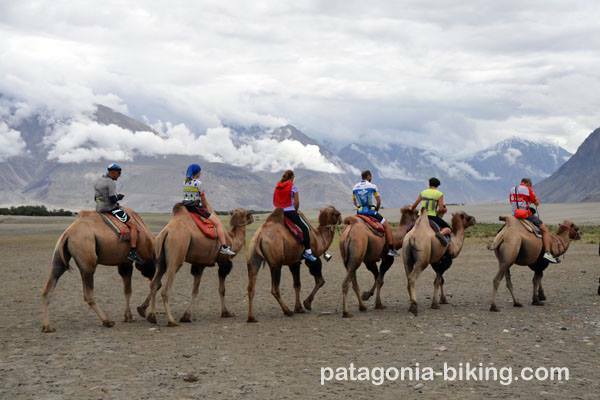 We will have a nice and comfortable riding stage, the Karakoram snowy mountains as a background. The weather is warmer than in the previous places we visited and the vegetation lusher, there is a great variety of trees and flowers. We will visit Samsthanling monastery. Distance: 30 km. Level difference: +300m, -300m. 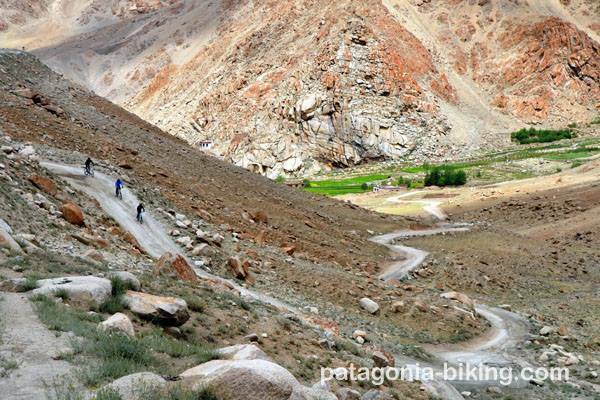 We will ride through the villages of Khalsar and Kardung, while ascending and getting near the Kardung La Pass. Distance: 62 km. Level difference: +1600m, -200m. 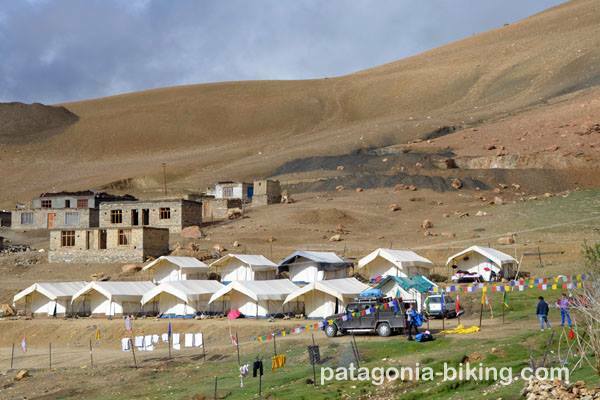 Lodging: camping at pass base. 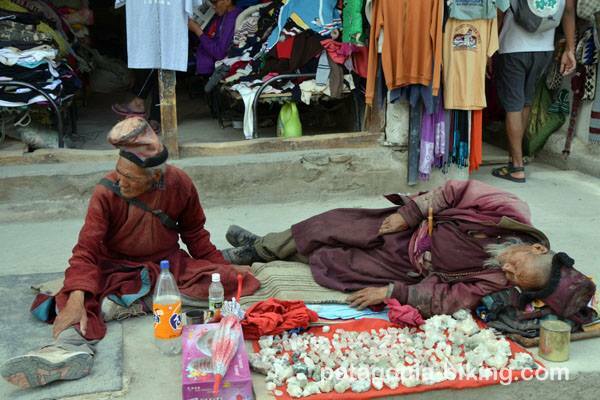 This is the most important day of our trip: it takes place on the main road that connects Kashgar with Leh and China. About 10.000 horses and camels go through this road each year. 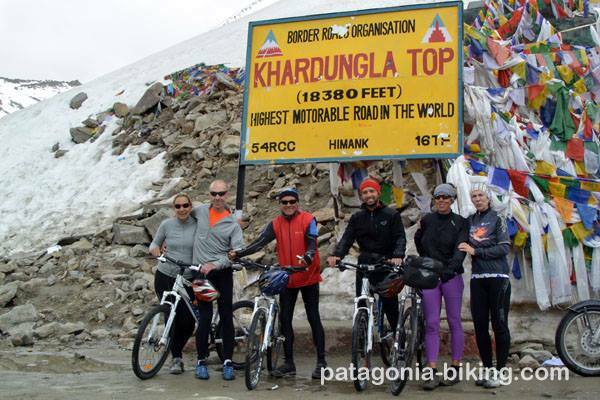 Honored by many bikers and the “Indian business” as the world’s highest accessible pass, it doesn’t really measure 5600mosl as they say, but 5360. 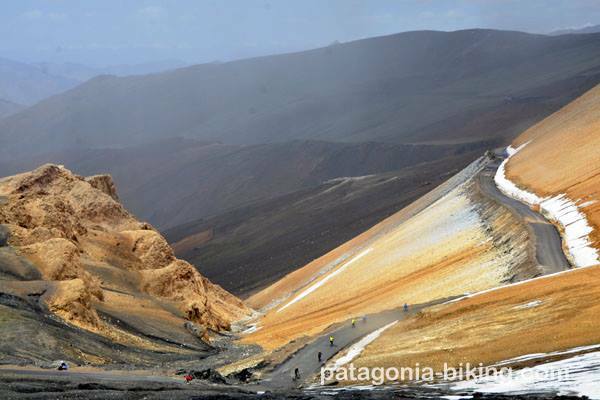 After a 15 km ascent we will be rewarded with a 35 km descent with spectacular views! Farewell dinner. 18 days. 15 stages. Make inquiries regarding 13 day trip. 775 km (over 80 % is pavement, not always on good conditions. Some dirt stretches. The trip is done between 3000mosl and 5350mosl. medium to high, some demanding stretches. 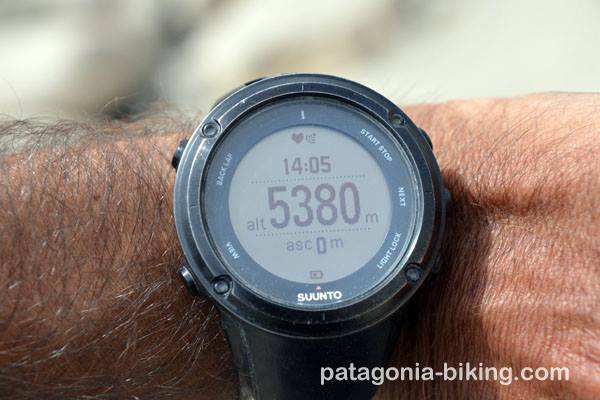 The slow pace and planning of stages will allow us to get used to altitude. 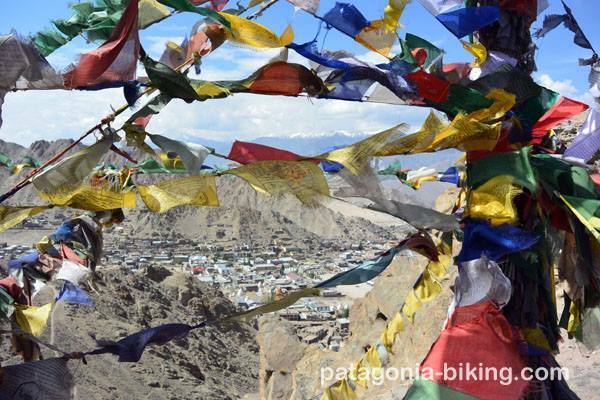 In Ladakh –which means “land of countess passes”- we will get closer to the highest passes in the world. Slopes are not usually over a 6 % tilt and they are easy on the rider. Support vehicles will always be available for those who need them. There will be 3 passes over 5300mosl, those who wish can do them on the support vehicle and so considerably reducing the effort. The positive level difference overall in this trip will be 9500m. 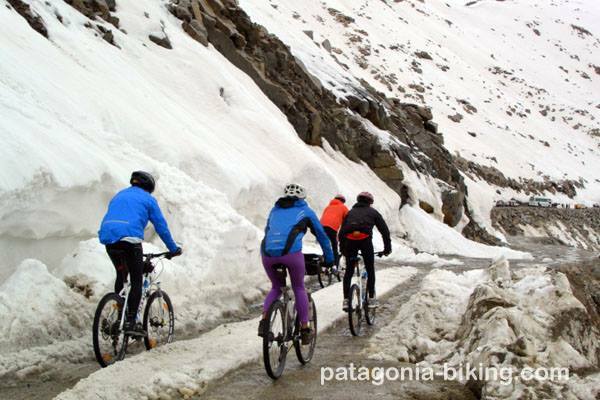 We will ride an average of 52 km a day, with an average of +640m level difference. 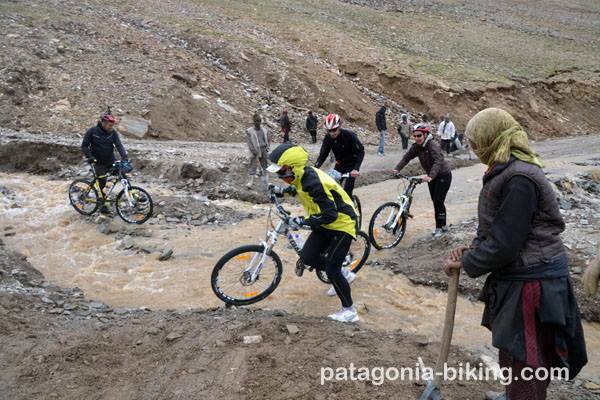 We probably will finish most of the stages by 2 pm and the rest of the day will be spend sightseeing or resting. Note: this trip requires a thorough medical check-up and a doctor’s certificate. Temperatures vary between 5 C and 25 C, but can go as low as 0 C at high altitudes during the night. This area is sunny 300 days a year. 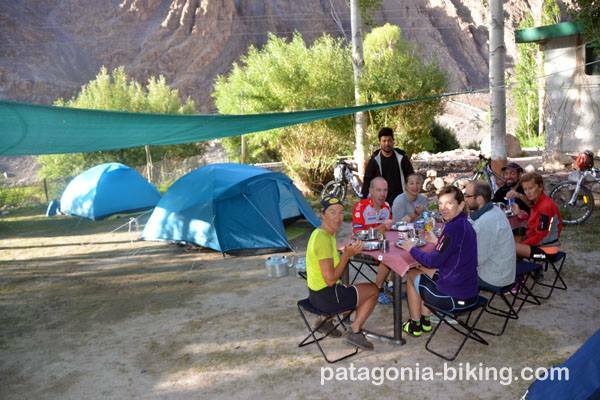 there will be frequent stops and every 2 or 3 hours we will offer drinks (water, coffee, tea) and energy snacks. There will be a longer break at midday for lunch. The support vehicle will always ride along the cyclists and will be available for any need. 8 people. Maximum: 12. It is important to register early on in order to book flights.